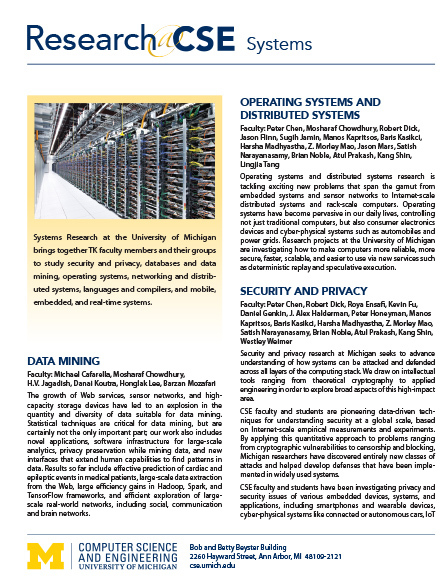 The Software Systems Laboratory at the University of Michigan comprises a multidisciplinary group of researchers conducting research in software systems. The lab focuses on the experimental design, implementation, and evaluation of systems software technologies, which enable the development of a wide range of emerging applications. Enabling technologies covered by the Systems Lab include biological databases, collaborative computing, compiler and language design, embedded and real-time computing, fault-tolerant computing, file systems, host and network security systems, mobile and distributed systems, network protocols and architectures, operating systems, peer-to-peer storage systems, power-aware adaptation, securitypolicy management, virtual machines, web databases. Some of the students affiliated with the Systems Lab will be on the job market during this academic year. Information about students seeking postions, including their contact info, is here. This website is a good source of information if you are interested in pursuing graduate studies in systems, networking, security, or related areas. To apply for our graduate program in CSE, please visit our prospective student page on the CSE website.